But the plumber was able to make adjustments to allow room for the oval escutcheon/cover plate which could be used on its own. Having the faucet replaced was a nerve-wracking enterprise. I was afraid tiles would crack or fall off when the plumber cut into the wall, especially after he pointed out that some of the tiles were loose. It would be impossible to find exact replacements for 40-year-old tiles. Also, I had no idea what he might find when he opened the wall, though I was certain he would find at least one oddity. I just hoped it would not be too serious an impediment. 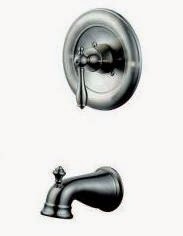 Overall, converting an old three-handle faucet is not an inexpensive project. I paid $178 for the faucet kit, $58 for the cover plate, and $500 for the plumber to do the work. But I believe it will be worth the money. 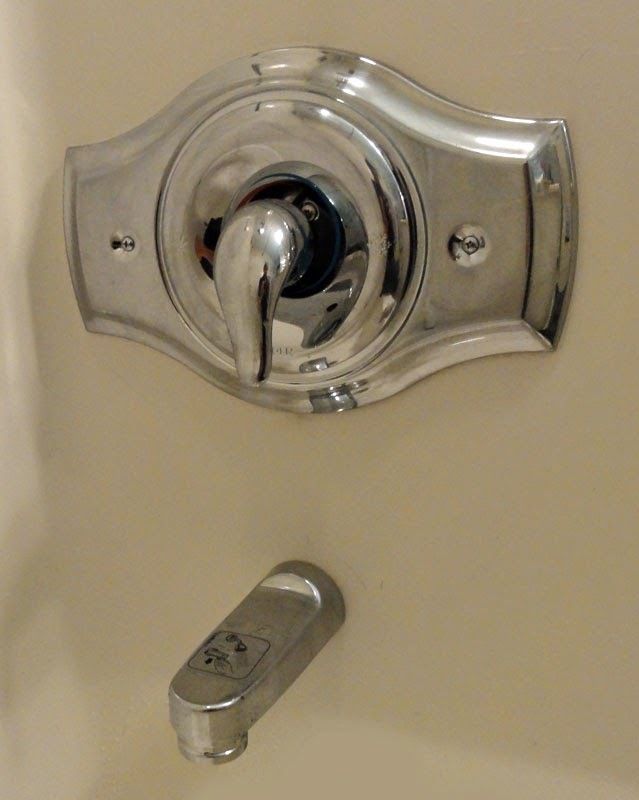 I use the shower every day, and I was very, VERY tired of fighting with the difficult old handles. Yesterday was supposed to be New Faucet Day. Alas, the plumber had major "unforeseen circumstances" that delayed him. Three hours after my appointment time, his office called to see if we could reschedule. :( GRRR. I'd already planned to take the day off work due to construction at the office. If I'd taken the day just for the plumber, I would have been really annoyed. Now I'm off to argue with the faucet handles to see if I can convince them to give me water of a comfortable temperature. And I was so looking forward to a cooperative shower experience today. Sigh. My bathroom remodel begins in five days! :D Hooray! I'm starting big with the most complicated, most expensive, most functionally significant portion of the remodel -- replacing the shower faucet. 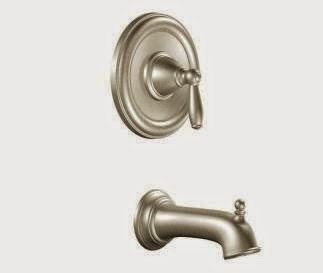 As I mentioned in a previous post, the tub/shower handles have been a real pain for some time. They are hard to turn, and it's difficult to make small adjustments so that the water isn't too cold or too hot (and that's when the cold water isn't turning itself off). I have previously replaced the faucet stems, but it was only a temporary fix because they wore out after a couple of years. The long-term solution is to replace the valve inside the wall. For that, I need a plumber... and that's why this will be the most expensive portion of the remodel. Not ideal, but I can live with it. My main concern is that there is little room for a cover plate because the handle and tub spout are very close together. By the way, that's not mold (ick! ), it's cracked grout. I had to order everything, so I wasn't able to measure the tub spouts or see the finishes. I ordered two faucet kits and three cover plates in the hopes that some combination of them will work. It turns out that all the finishes are quite similar.